Made by Unknown (person) in Australia, Oceania, 1983. This t-shirt has significance as a record of the ‘Stop the Drop’ concert held at Melbourne’s Myer Music Bowl on Sunday 13 February 1983. The donor Kevin Fewster was one of the organisers of two ‘Stop the drop’ concerts, this and another held in 1984. Both events featured Australian rock bands and raised funds for People for Nuclear Disarmament. Cream-coloured short sleeve t-shirt made of polyester cotton jersey. 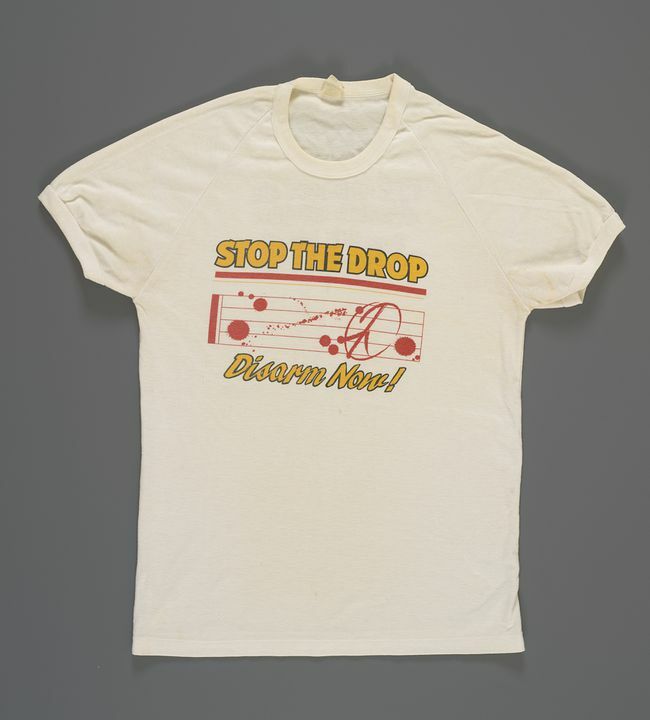 Text on front in yellow and black lettering: 'Stop the drop / Disarm now!'. With a red illustration of a peace sign on musical stave. Text on back in yellow and black lettering: 'INXS / Midnight Oil / Goanna / Redgum / 3pm Sun. Feb.13 Myer Music Bowl'. One tag on back of neck with text: 'Size 20 / Chest 105cm'. Other tag on back of neck has washing instructions plus text: 'Polyester / cotton / Made in Australia'. According to correspondence with the donor, the 'Stop the drop' logo was designed by 'a small graphic design office in Melbourne who the Oils were using then for tour posters'. Maker unknown. The donor Kevin Fewster was one of the organisers of the 1983 'Stop the Drop' concert. He wore the t-shirt on the day of the concert.